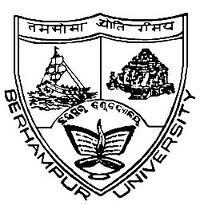 Berhampur University Accredited by NAAC with "A" is the first and only state funded University with that distinctive achievement. Candidates should have Post graduation degree with at least 55% of marks or its equivalent grade, 5 years administrative experience in the next lower grade or in a supervisory capacity for post 1, 2nd class Graduation in Life Science for post 2. Candidates should have to pay Rs.1,000/- (Rs.750/- for SC/ ST) in the form of Bank Draft drawn in favour of Controller of Finance, Berhampur University payable at SBI, Bhanja Bihar (Code: 2017). Eligible candidates can apply online through the website www.buodisha.edu.in from 25-05-2017 & send their hard copy of application along with self attested copies of all certificates, mark sheets, documents in support of UG & PG teaching research experience, production of Ph.D, copies published articles, certificate containing the record of date of birth & other relevant documents by speed post/ registered post to the Registrar, Berhampur University on or before 30-06-2017 by 04:30 PM. The Envelope containing the print-out of the application should be superscribed with the name of the Department/ College and post applied for in Block letters. The closing date to submit the application form is 30th June 2017 by 4.30 PM.